Ramapo College of New Jersey Home Page » About » Success Stories » Success Stories » Clifton E. Shambry Jr.
“I am a proud Ramapo alumnus of Ramapo College as I have had the opportunity to develop great relationships and experiences with my peers, faculty, staff and administration cultivate my interests and professional pursuits. Being the first in my family to graduate with any degree is a huge testament to the support that I received from Ramapo, aiding me in moving forward to graduate studies, conducting national research on college educational quality and supporting students through their own collegiate journeys. One of the greatest things Ramapo offers is opportunities to get involved. It only takes one opportunity to help you gain experiences, knowledge and networks to excel, which is why I believe I am where I am today! I have so much gratitude to Ramapo for taking a chance on me as an EOF transfer student. 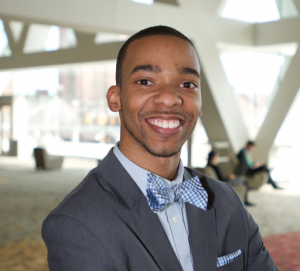 It has helped me develop into the professional I am today.” – Clifton E. Shambry Jr. ‘12 graduated a B.A. in Business Administration with a concentration on Management and earned his MA in Higher and Postsecondary Education from Teachers College of Columbia University in 2014.